The STS-128 crew members gather for portrait on the 225-foot level of Launch Pad 39A with their shuttle Discovery. 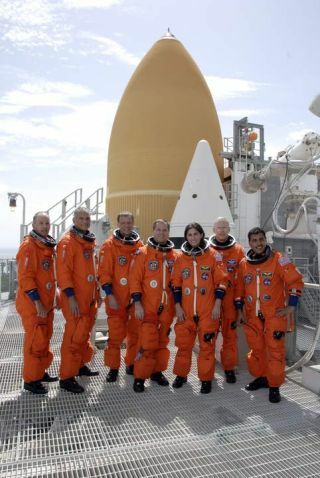 From left are commander Rick Sturckow, mission specialists Danny Olivas and Christer Fuglesang, pilot Kevin Ford and mission specialists Nicole Stott, Patrick Forrester and Jose Hernandez. NASA willtry to launch the space shuttle Discovery next week after settling outlyingconcerns with the foam insulation covering the spacecraft?s external fuel tank. Discovery isnow slated to blast off next Tuesday at 1:36 a.m. EDT (1736 GMT) from a seasidelaunch pad at NASA?s Kennedy Space Center in Florida. The launch date decision cameafter an extended, two-day meeting by top NASA officials to review whether the shuttlewas safeto fly a nearly two-week trek to the International Space Station. ?I thinkwe?re ready to go fly,? said William Gerstenmaier, NASA?s space operationschief. ?We?ve got a pretty tough mission in front of us again. These stationmissions are not easy.? Gerstenmaiertold reporters that the decision to try to launch Discovery next week wasunanimous, though there was a lively debate over whether more tests should beperformed on the shuttle?s foam-covered external tank. A handful of engineersfavored performing the extra tests - which could delay the flight to October -but ultimately signed off for Tuesday?s launch attempt, he added. More foamthan usual fell from the shuttle Endeavour?s fuel tank during its launch towardthe space station in July. NASA isn?t sure exactly why the foam debris poppedfree from a ridged part of the tank called the ?intertank? just above itsmidpoint. Engineers spent weeks testing foam on the same area of Discovery?s15-story tank, finding it fit for flight. ?We don?texpect foam losses in those areas,? said John Shannon, NASA?s space shuttleprogram manager, adding that some foam debris shedding may still occur. ?Thatwas sufficient flight rationale and that?s what we?re going to go fly with.? NASA haskept a close watch on the amount of foam debris during shuttle launches since a largepiece damaged the shuttle Columbia?s heat shield during its 2003 flight,leading to the spacecraft?s destruction during re-entry. Sevenastronauts were killed in the tragedy. Commandedby veteran shuttle flyer Rick Sturckow, Discovery?s seven-astronaut crew ispoised to fly a 13-day mission to deliver a new crewmember, a cargo pod packedwith 15,200 pounds (6,894 kg) of fresh supplies and experiment gear, and atreadmill named after American comedianStephen Colbert. Three spacewalks are planned for the mission. Earlierthis year, Colbert attempted to have a new room for the space station namedafter him by urging fans of his Comedy Central television show ?The Colbert Report?to write his name in during a NASA online poll. NASA named the new roomTranquility in honor of the Apollo 11 moon landing, but dubbed the newstation treadmill riding on Discovery the Combined Operational Load BearingExternal Resistance Treadmill (COLBERT) as a consolation prize. NASAofficials said Colbert has been invited to watch his namesake treadmill launchinto space, but the comedian has said he will not be able to attend. Discovery?sSTS-128 mission will mark the fourth shuttle flight of up to five planned forthis year. NASA has until Aug. 30 to launch the mission before it would have toconsider standing down until Oct. 17 to avoid a space traffic conflict withJapan?s first H-2 Transfer Vehicle, an unmanned cargo ship slated to begin its maidenflight to the space station on Sept. 10.